Well, folks, the flap over our local (Albuquerque, New Mexico) PBS affiliate, KNME, and its refusal to show “Unlocking the Mysteries of Life” is still going strong. A local columnist, Jeffry Gardner, wrote a column on Thursday Jan. 20th about the flap. This very strange piece slammed our science group, NMSR, for supporting KNME. 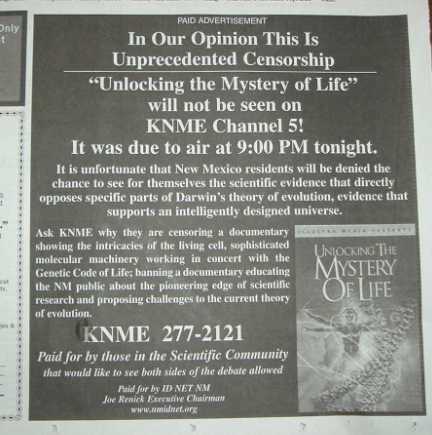 In making the decision to cancel the show “Unlocking the Mystery of Life,” derisively referred to as “creationism” by the rabidly anti-Christian voices that squeak like greaseless wheels in the so-called science community, KNME-Channel 5’s radio marketing manager Joan Rebecchi said “Life’s” producers had not just an agenda but a religious agenda. KNME’s decision was cheered by a group called New Mexicans for Science and Reason. The Science and Reason folks slammed the show as “religious propaganda” and made it clear we all benefited from their and KNME’s collective protection. The Discovery Institute has taken Notice, and has posted Gardner’s column on their website. But the Discovery Institute might want to have Gardner open his mouth so they can check around a bit before making a purchase. We’re shelling out more than $300 million annually in state and federal tax dollars for shows like “Charlie Rose” (name the last conservative you’ve seen yucking it up with Chuck), “Frontline,” “American Experience” and “Nova” - all agenda-less programs, I’m sure. With this soundbite, Gardner shoots from the hip, and misses badly. Just this week, the Charlie Rose show’s guests included the “arch-liberals” Newt Gingrich, Richard Perle, and Henry Kissinger. That’s some crack research there, Jeff. …he reached his conclusion by virtue of what he’d learned about intelligent design. So, if Gardner is so obviously wrong about PBS programming and Flew’s conversion, why is the Discovery Institute promoting his ill-conceived editorial? P.S. Just before I used my digital camera to snap a pic of the anti-KNME ad the local ID group had published, I moved a little too fast, and spilled a drop of coffee near the “K” of KNME on the lower left. I was surprised recently, when I found my coffee stain on the web site of Illustra Media, producers of the “Unlocking the Mysteries of Life” video. And don’t miss the support expressed for KNME by the New Mexico Academy of Science.